The kit is easily plugged on a kayak, without modification, by simply bolting central module supporting beam and rig to existing standard inserts of the boat (central module interface points are specific to each kayak model). Position the beam longitudinally to the kayak and slip it onto its rotation axle fastened to the central module. Tie the beam to the kayak using the elastic attached to the central module. Dont’ forget your paddle, your skirt and your life jacket; you are then ready to go. You can then comfortably paddle without being hampered by the kit. Folded configuration will be much more suited to cross the breaker waves when starting from a beach. As soon as conditions become favourable to sailing, don’t hesitate to unfold ! Untie the elastic securing the beam; then lift it with your two hands, and at the same time make it turning around its rotation axle to put it in unfolded position, in front of the man hole. On each side, move the hoist above the beam and hook the hanks in the shackle fastened to the central module; then strain both tackles. Unfold successively each float by pulling the related unfolding rope, and simultaneously by releasing the other folding rope. Untie the elastics securing the rig, then move aft the rig in order to be able to lift it above the beam. Note: bipod shrouds: we are also performing tests for simplification (to reduce the number of ropes on board) to replace them by a fastening system using a hook as for ski shoes, directly mounted on the bipod. The idea is to get, when the bipod is joined to the mast, a self-supported tigid tripod. Release the second rope maintaining the battens flattened against the mast to have the sail unfolding. 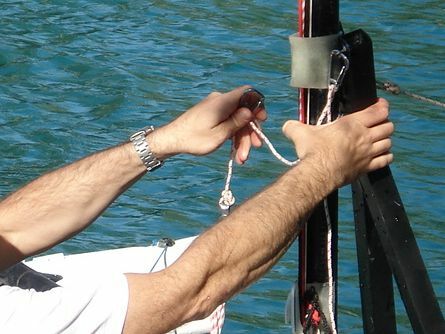 Tighten the 3rd rope tied to the tack of the sail. Paddle to get enough speed and position adequately the boat with respect to wind direction (she will find more easily her balance, particularly when going close hauled). If the kayak has no rudder, then use your paddle as a very efficient one.